Good Saturday Morning folks!..coming up on 7am and its a tad foggy outside here..and about 54 degree's but no wind so it isn't bad at all..hope its the same where you are..well a Nice weekend on tap enjoy...have a great day everyone! Morning. Sunny, cool start to the day here with some patchy ground fog. Headed to Jax Beach in a couple of hours for our belated Thanksgiving feast. Perfect afternoon weatherwise with a high of 72, plentiful sunshine, and calm winds. If I don't pop on in the next 24 hours it may be due to the food coma I will be recovering from later. That would be nice to have a wet start to our dry season. I hope we get a really cold snap this winter. Good Sunday Morning folks!! another Nice day ahead for us,just a tiny chance of a brief shower in some places...well have a wonderful day everyone! Good morning. I've seen hints of some cooler weather but it's still 10 days plus out. Will it reach FL? We shall see. Can't complain here - the temps have been great the past month. well I guess everyone is out doing something today,other than a few sprinkles etc down in SW Florida the day is a sunny one mid-70's to near 80 in some spots..nice where I am..should get cooler as the sun goes down later.........guess i'll say good night everyone! Our temps haven't made it down to "nice" yet. We're just too far south. a Bad situation this morning out in Lakeland Florida.......................................A train carrying molten sulfur detailed outside of Lakeland early Monday morning and Polk County Fire Rescue is advising residents along Strickland Road to stay inside, officials warn. Hazmat crews are working with CSX Corporation, "a leading supplier of rail-based freight transportation," and state officials have determined that a derailed train is leaking molten sulfur after Polk County Fire Rescue came upon several train cars "rolled over and mangled" while returning from a separate call at around 1:50 a.m., officials stated. Good Monday Morning folks!..well outside of some possible heavy fog around florida no weather events,and it looks that way thru most of the week..enjoy...have a wonderful day everyone! UPDATE: The Polk County Sheriff’s office is going door to door notifying residents on Strickland Road about the shelter in place order. Strickland Road is closed and no one can go in or out at this time. Parents are being asked to monitor their children closely to make sure they remain indoors. It has been confirmed that there is a molten sulfur leak. John if your back..do you go anywhere near this area in Lakeland? I guess the front has stalled over the Florida Straits. Would prefer it not to rain tomorrow. Work reasons. 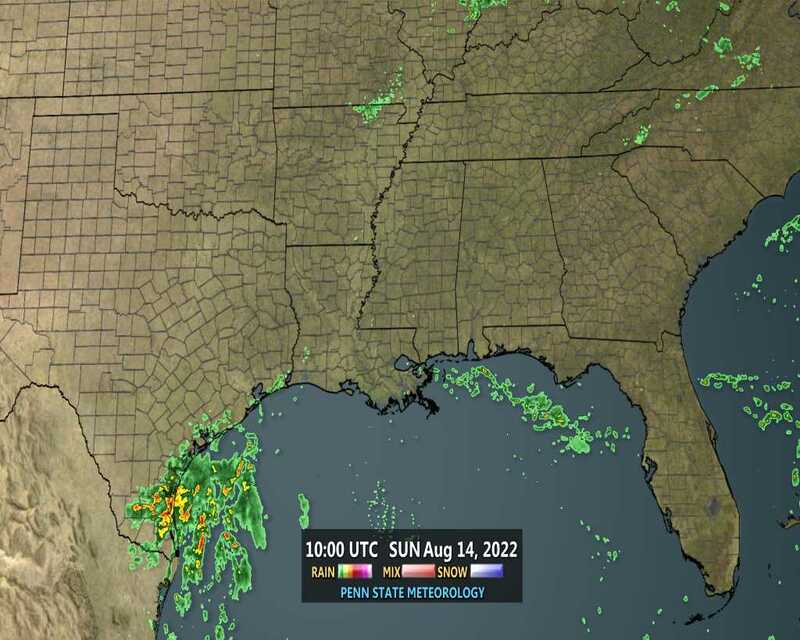 BillsfaninSoFla wrote: I guess the front has stalled over the Florida Straits. Would prefer it not to rain tomorrow. Work reasons. morning (Tuesday) Billsfan..its just about 4am and it looks like just a few stay showers down by you right now..good luck ok.
hazard with any storms will be lightning. along the Atlantic beaches of South Florida. 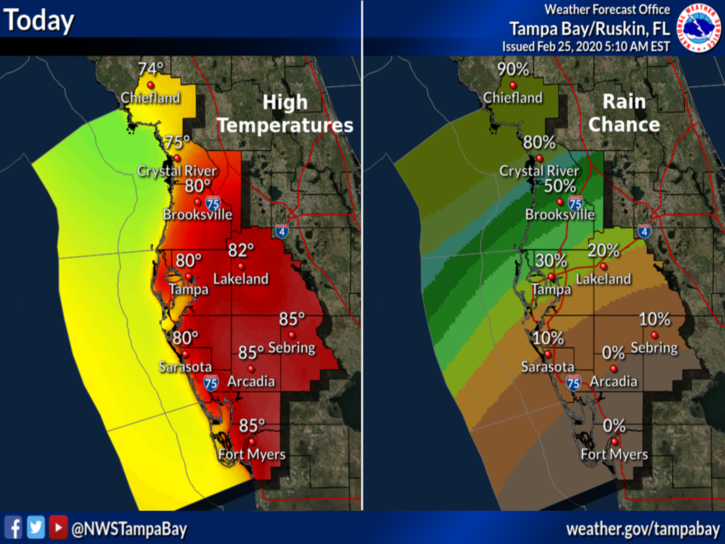 Good Tuesday morning folks...another warm dry day around tampa bay area..could be a few showers to our south..........well Have a great day everyone! Not as chilly this morning with temperatures in the upper 50s and low 60s. We'll see a mix of sun and clouds this afternoon. Highs will reach the low 80s this afternoon. Humidity will begin to rise during the day. Looks like a quiet week ahead. A weak front may bring us a quick shower Thursday followed by slightly drier air for the end of the week and the weekend. or zone changes are required at this time. anyone else think the car manufactures should install something IN cars..to kill cell phones..only time you CAN use the phone is when the car is OFF and your Outside it? 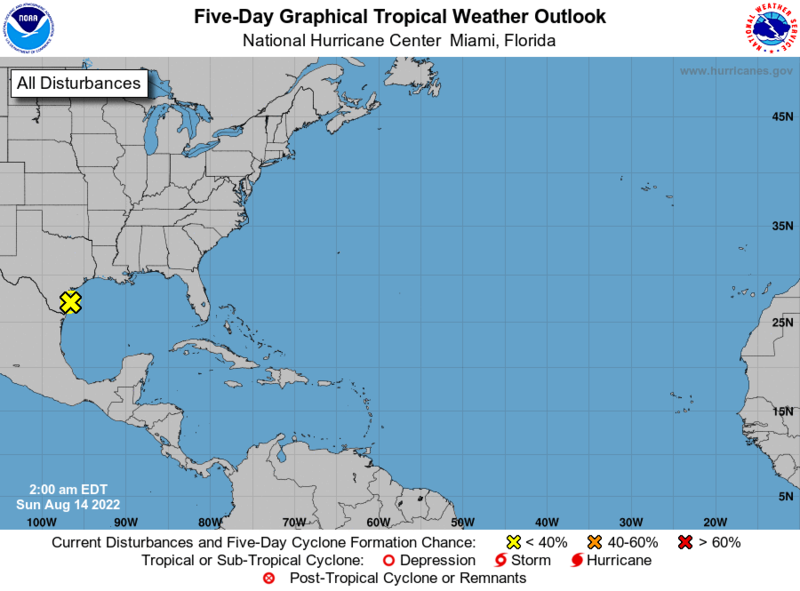 well models today are hinting at maybe a rain event around the 9th/10th of December for us..we'll see how this frontal system plays out huh...tropics are finished...now we watch the frontal systems. gee that's a nice site there Aug.
Hiya Billsfan,its funny,most of the NWS's discussions also were saying possible showers too down there yesterday,some models also..guess it was a hit or miss kind of thing huh...well for my area next few days dry and hardly no rain at all local met said. 11 p.m. -- Tampa Police announce they are in the process of making an arrest in the Seminole Heights murder cases. Howell Donaldson III, 24, will face four counts of first degree murder in connection with the investigation. they should bring back the electric chair for that tampa serial killer. Good early Wednesday Morning folks..another dry day around here they think....some florida congressman wants to get rid of "daylight savings time"...........do you agree or disagree with it?..........myself I am for..getting rid of it. Billsfan..forecast for fort Lauderdale for Wednesday............Wednesday: Showers and possibly a thunderstorm before 1pm, then showers likely. High near 82. Northeast wind 11 to 15 mph, with gusts as high as 20 mph. Chance of precipitation is 80%. New rainfall amounts between a half and three quarters of an inch possible. LargoFL wrote: Good early Wednesday Morning folks..another dry day around here they think....some florida congressman wants to get rid of "daylight savings time"...........do you agree or disagree with it?..........myself I am for..getting rid of it. Good morning Largo. I am for keeping DST all year round and have adjusted my office schedule accordingly. I would rather get to work in the dark, than get home in the dark. I'm more on your schedule now. Up at 4:30, dinner at 5pm. The evening walk/bike starts with the sunset. Hello All. I've not been around much. Fall weather tends to make me busier, with both indoor and outdoor projects. Everything is much more bearable with temps between 60 and 80. I hope all had a good Thanksgiving holiday. I was in Jax for the week, and had some great family time and a very traditional meal. I only had to handle the turkey, gravy, and pecan pie. I got all of the turkey bones, so now have plenty of turkey soup for continuing doses of tryptophan. On Aug's earlier question about the No-Name Storm, I do certainly remember it. I was living in Largo at the time. I have never witnessed such lightning than on that night. I was watching from my back patio with absolutely constant lightning and 2 transformers exploded nearby. It was quite exciting. hiya JR, yeah that's a good point too..im thinking like me..i hate changing the clocks and having to get used to that extra or minus hour.. Hours after a man was taken into custody in connection to the slayings of four Seminole Heights residents, Tampa Police Chief Brian Dugan was emphatic: "I assure you, this is the man that did this." Agreed here JR. The more evening daylight, the better. This time of year for me it feels like midnight when it's only 7pm. Guess that explains the couple of times I dozed on the couch the past 2 weeks at 8pm. I hope the guy in custody is the killer. I've been hooked on Investigation Discovery the past month. What looks like a great lead doesn't always turn out to be the case. Leave time change alone. I'd rather the sun not be out at 8:30 in August. We got at least five inches of rain overnight. Amazing. Guess she was right. Timing off lol. BillsfaninSoFla wrote: Leave time change alone. I'd rather the sun not be out at 8:30 in August. We got at least five inches of rain overnight. Amazing. Guess she was right. Timing off lol. congrats on the rainfall Billsfan! !..not a drop here by me. Sounds like a compromise is in order. Just flip it around. DST Autumn Equinox thru Spring Equinox. Standard Time Spring to Autumn. And as an added bonus, folks won't be late for Easter services! Now, why can't our legislators learn to do that!!! Checking in from the Nature Coast. What gorgeous weather we have been having. Todays low of 49 was quite a bit cooler than forecast, but it felt great. The afternoons have been approaching 80 degrees which is almost 10 degrees above normal, but with low humidity I am not complaining. Looks like our mornings will be cool in the lower 50s, but still above normal through the weekend, then we finally might get back down to seasonal temps with a cold front passing the middle of next week. I noticed the drought monitor has from Levy county around the big bend into the panhandle now in drought conditions. Will likely get much drier as we head through winter into next spring. waterdipper wrote: Checking in from the Nature Coast. What gorgeous weather we have been having. Todays low of 49 was quite a bit cooler than forecast, but it felt great. The afternoons have been approaching 80 degrees which is almost 10 degrees above normal, but with low humidity I am not complaining. Looks like our mornings will be cool in the lower 50s, but still above normal through the weekend, then we finally might get back down to seasonal temps with a cold front passing the middle of next week. I noticed the drought monitor has from Levy county around the big bend into the panhandle now in drought conditions. Will likely get much drier as we head through winter into next spring. yeah WD I think your right,i bet i'll be having drought conditions here as well.